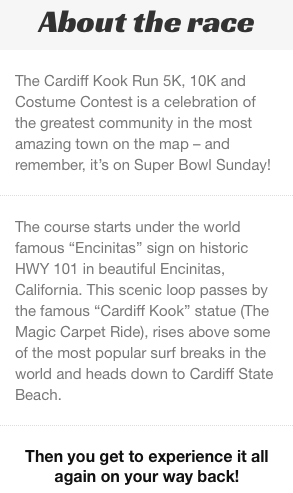 I totally forgot about the Cardiff Kook Run until Friday! With the hubby being out of town (he's on a guys camping trip in Joshua Tree) and the morning off work, I figured I could try and squeeze it in on Super Bowl Sunday (the race is always on the morning of Super Bowl Sunday). 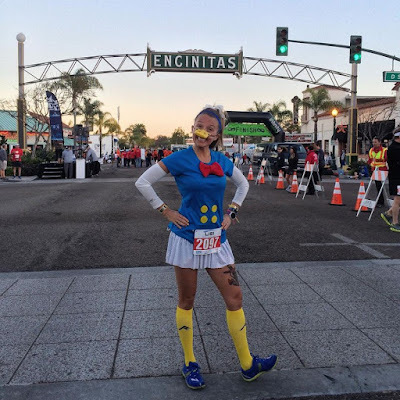 There's a costume contest aspect of the race, and although I never "technically" enter, I always love running in some sort of funny attire. 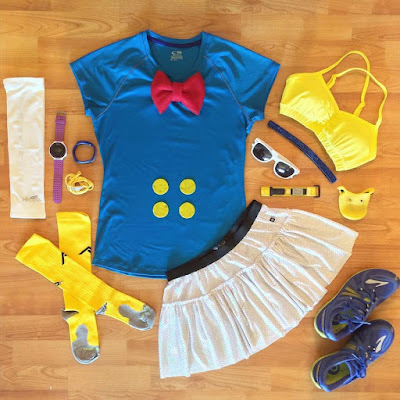 Well, with the last minute add of the race, it meant very last minute costuming, but thankfully I had the materials in the closet to throw together a decent Donald Duck costume. Momentum Jewelry wrap ("positive energy") and can't forget a DUCK BILL! The Cardiff Kook Run offers a 5K, the "Kook" Distance (which is a 4-miler, with the turn around spot at the Cardiff Kook statue - although I heard from a friend who ran it there wasn't any differentiation from the 5K and no signs for the turnaround point [hoping that they change this in the future because I would totally run a 4-miler, I mean it's an automatic PR since I've never raced that distance before ;) ] ), and a 10K. Although I only had 3 miles on the calendar, I decided to opt for the 10K (because, you know me, I have a real hard time turning down extra mileage). 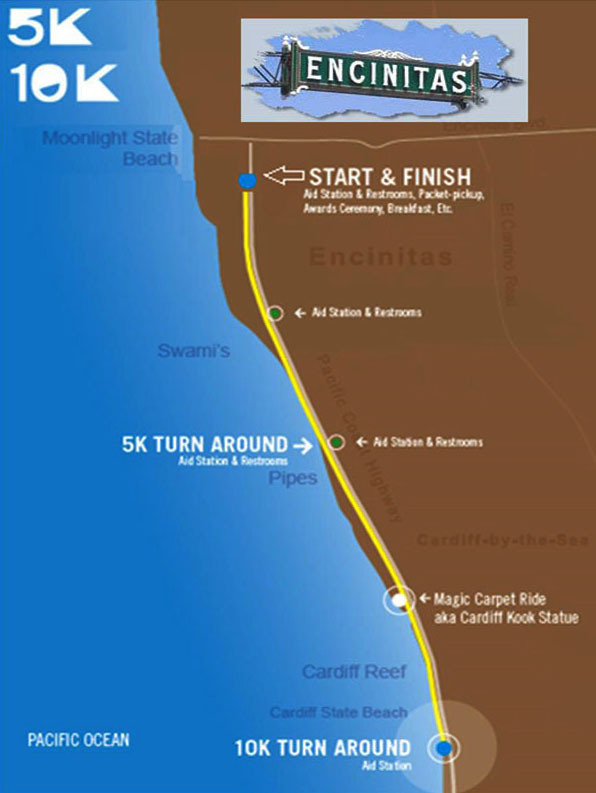 I drove down to Encinitas around 6:15am so that I could pick up my bib before the race, which started at 7:35am (they do offer bib pick-up throughout the weekend, but with the late add and the super busy Saturday I had, race morning worked out PERFECTLY). I didn't have any issue with street parking (and even ROCKED my parallel parking job!). Everything was very well organized and efficient. I do appreciate the fact that you pick up your participant race tee AFTER the race, that way you don't have to worry about taking it back to the car before the race (since no gear check is offered). toe the starting line of yet another amazing race! Anywho, the National Anthem played and we were off! I didn't really have a game plan for the race. The LA Marathon is next weekend, so I kept that in mind and didn't want to do anything crazy. I figured I would try and keep around an 8:00/mile pace and see how I felt, especially with the temps expected to rise quickly during the race. The course is BEAUTIFUL! But, then again, I already knew that! It's one of the reasons why I run the 101 for my long runs - beautiful views, stunning scenery and (sometimes) beach breezes. Although, somehow, I always block it out that the steady downhill for the first 3 miles turns into a gradual UPHILL for the last 3 miles. Can't beat the views with a 10K along the coast! The heat started making an appearance by mile 2, which is NOT a good sign for next weekend's marathon, but I guess that just means we need to run faster to beat the heat, right?! Often times, folks will ask me what I think about while I am running. I thought it would be kind of fun to recap a few of the ramblings in my noggin' during today's race. Hope my hands warm up or I may drop my phone. I wish people paid more attention to the pace signs... Self seeding can make for dangerous course conditions and lots of bobbing and weaving. Started too fast, thanks shins for reminding me. Here comes the sun, do do do do, Here comes the sun and I said, "I'm alright!" I know I run by the ocean often, but man these views never get old! I hope I never take them for granted. Oh, look, the elites are already heading back towards us - holy speed! Well that sure warmed up quickly. 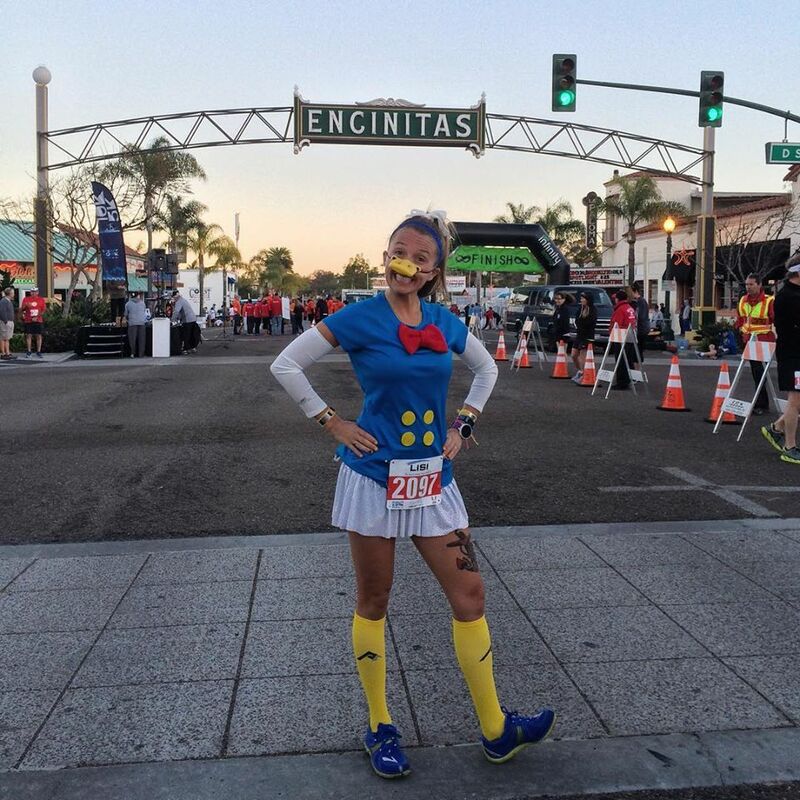 Maybe these Donald Duck "arms" weren't the best choice, even if it did go with my costume. There are less people dressed up than in years past. I remember the last time I ran this race and there was a group Sprinter costume - yay for public transit! I know I run this area often, but man do I forget how the gradual downhill on the way out turns into gradual UPHILL on the way back. Guess that just means we've gotta work for that finish line. Some people hate out-and-back courses but I love cheering on fellow racers! YOU GO RUNNER! Ah, here is where we join with the 5K'ers. And this is where the fun people are! Look at those costumes! A couple is running with a couch! They totally win today! I appreciate that they keep the 5K and 10K separate for the first part of the 5Ks turn around before everyone merges together. Helps to make sure folks are aware of their surroundings. Will this hill EVER end?! Can you believe people eat an average of 2,500 calories at Super Bowl parties?! WHAT?! But, in all honesty, what should I make for lunch? It's quite toasty out here. 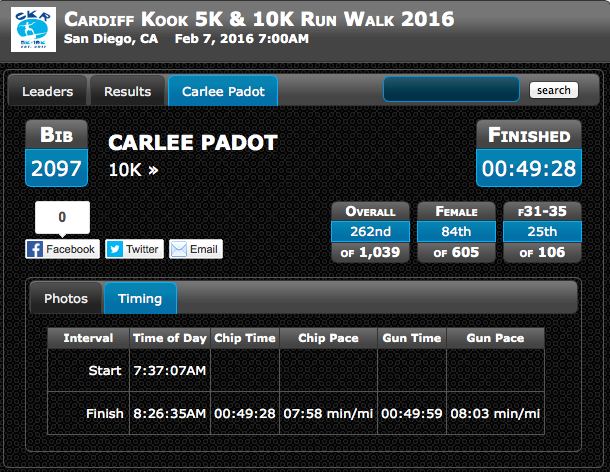 Glad that this is only a 10K and I'm not running Surf City Half or Full like some of my friends. High fives for all the spectators! I can see the finish line, time to kick and see if I can pass those girls. Beat those 6 women - YES! Now let's hope some of them were in my age group. I sure hope LA is NOT this hot next weekend or I will REALLY need to adjust my game plan. Shut the front door, I think I just PR'ed! I did... By 7.5 seconds... But a PR is a PR, right?! Time to grab my participant tee and head home to cuddle with the pup. After I crossed the finish line, I grabbed my medal and saw Eric (you know, the owner and brain behind PRO Compression) so had to snap a picture. He joked that he needed proof he actually still runs these days (but he smoked me in the 10K, so not only does he still run, he runs FAST!). Honored he lets me rep his brand as an ambassador! The man, the myth, the legend - Mr. Eric Smith ladies and gentlemen! Then it was time for some water. I didn't get any on the course (normally don't take hydration with me on runs under 5 or so miles, depending on the heat of course) and was parched due to the quickly rising temps. Although the tiny cups worked well during the race (most people don't take more than a sip or two anyway), at the finish line I would have much preferred larger cups. They didn't have any goodies (like bars or bananas), so I would have liked to have seen more than 2 or 3 ounces of water per person. Thankfully I had a sports drink waiting for me in the car. What can I say?! I know how to have a strong Wrist Party! My Arm Candy was ON POINT! After downing a couple shots of water, it was over to the shirt pick-up to grab my participant tee. It's pretty boring this year - a black cotton tee with white writing, but since I will use it to for my next Project Repat quilt, I don't really care too much. Looking back over my data, it looks like I was able to pretty much stick to my game plan. As you can see, the elevation wasn't terrible, but the slow and steady climb definitely "did me in" on the fifth mile. Overall, I've gotta be STOKED with a 7.5 second PR (my previous 10K personal record was an accidental PR at the Disneyland 10K) with my sixth full marathon in less than a week - which reminds me, gotta start hydrating NOW thanks to those warm Santa Anas! And, hey, overall I didn't do too shabby... Especially with such a FAST crowd in the San Diego area! What do YOU think about while you are running? I think about everything under the sun when I am running although the longer the run the more my thinking turns to food. Haha! Loved your race outfit. Super cute! Good luck next weekend!